Now in its fifth cycle, the event, which took place on September 28 in Marseille, rewards and recognises projects that push boundaries in balancing environmental performance, economic growth and social responsibility. Entries were taken from all over the world, with an unprecedented 792 projects submitted in the Europe region. British success came courtesy of ZEDpods Ltd, of London, receiving the Bronze overall award for its work in zero (fossil) energy development units on parking lots. This was commended for providing a valid prototype for a low-carbon architecture built above existing public parking spaces, seen as possibly an ingenious solution in solving London’s housing shortage. A further accolade came as Anna Androva was awarded the Next Generation 3rd prize 2017 Europe for her ‘Liquid Era’ project. A student at London’s UCL Bartlett School of Architecture, her project explored the new architectural vocabularies for a future city in an era marked as much by the physicality of things as by the liquidity of the digital realm. Chief Executive Officer at Aggregate Industries, the UK arm of the LafargeHolcim Group, François Petry (above picture, furthest left) was on hand to present the Next Generation 3rd prize to the UK winner. As a keen environmental enthusiast, he spoke with enthusiasm about the awards. “As we look at the construction industry, it is incremental that we balance the need for economic growth with sustainability. Aggregate Industries is committed to lead this transformation and help communities build their future,” he said. 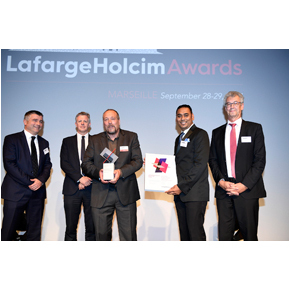 “We are proud to support locally the International LafargeHolcim Awards to reward and recognise those businesses and individuals who have truly pushed boundaries in sustainable design. “This is the most significant global competition for sustainable design and the fact that we had two local winning projects in the European Regional competition is a proof that UK is pioneering in this area, and we as a company, will continue our efforts to promote sustainable constructions. “We received an incredible response to the competition and were astounded by the use of truly innovative and future-orientated concepts submitted from around the world.